I can't sleep in planes. Believe me I've tried. I've been on 12+ hour trips, I've been exhausted, I've twisted and turned, I've used pillows and blankets, but no matter what I do. I can't sleep in planes...or at least in plane seats. The closest I got was on a particular trip where, out of desperation, I pulled down the trays of my neighboring friends, and kinda slept on a makeshift bed atop them. Ultimately, I was told to get down cause I was gonna break the trays, but at least I got in a good hour and a half of sleep. A WebApp is essentially an application that lives as a website. That might be a bit to broad, but essentially it is a website that has a purpose (other than to display a static piece of information). It is dynamic and it usually requires some sort of connection to a database or other sources of information. The Front-End: This is the part of the code/markup that is running on the user's computer. Visuals: The actual visuals / UI setup that gets designed in HTML markup, CSS, and other nifty things I generally don't like messing around with. The Back-End: this is the part of the code that runs on the server. It usually does some sort of database lookup, heavy calculations, or communicates with other services. In other words, it's a piece of code that for whatever reason must recide on the server (otherwise you would just be running it out of the client and saving precious computation time on your server). At this point you can start with either the front-end or the back-end. I've actually never read any information on which one you should start first, but I kinda like starting with the back-end; It just seems like a good idea to first determine what can and can't be done by your web-app, and then adding a front-end to it. To build our back end, we will use Python's library Flask. Flask is an awesome Python web micro-framework. As I understand it, a micro-framework is essentially a barebones webserver, where you get to install the plug-ins and actual tools you need. The benefit of using Flask is that it is brutally simple. Unliike Django and other frameworks that have a higher learning curve, 4 lines of code will be enought to get a flask server up and running. This code will go into an index.html located at inside the template folder. If you noticed at the start of the python flask server file, there is a segment that stipulates that when a browser requests the base url "/" (e.g. localhost), they shall be rendered the "index.html" file. This is technically optional as you could host this file via Apache or Nginx, while maintaining the python back-end hosted separately. The following snippet contains all the static code in the website, as you can imagine this is the things displayed on the website that don't really change. We can leave sections (e.g. divs, spans, etc.) with specific ids to use later on to dynamically inject data in there. In a way you can simply think of this as a template. 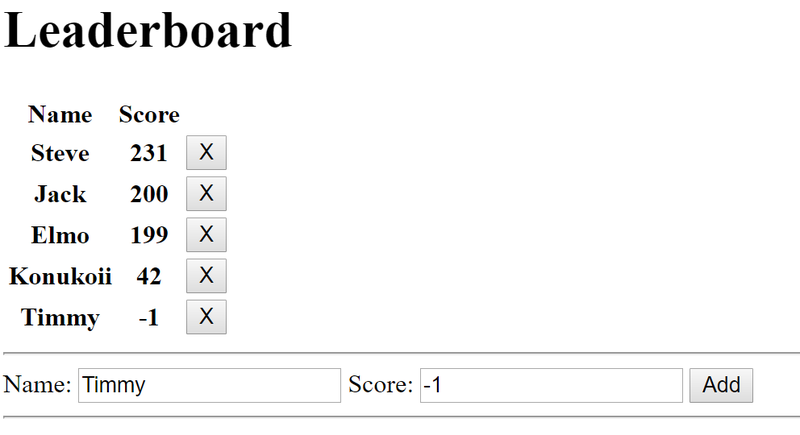 // This function takes in the data retrieved from the back-end and dynamically updates the leaderboard. // so you don't have to do this. But I was kinda lazy. When we put everything together, we will see a rather bare-bones, yet functional page. Well, I hope this brief write-up has showcased the simplicity and power of Flask, and potentially inspired you to take a look at such great tool! If you've always been intrigued in building web-apps, but never gotten around to actually doing it, I wholeheartedly recommend using Flask for fun and quick prototyping. As always, if you have any comments, suggestions, or questions feel free to hit me up! - Have you installed the proper dependencies? - Is there some indentation issue (or perhaps some special character that got copied along)?